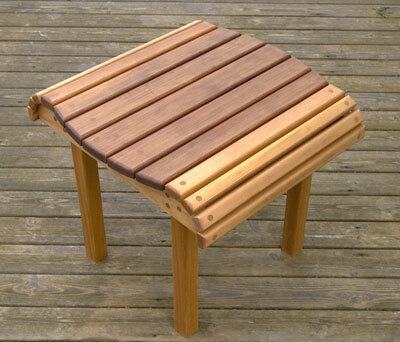 The RunnerDuck Cedar End Table plan, is step by step instructions on how to build a Cedar End Table. 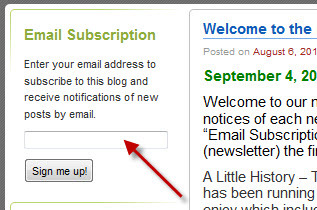 This project appeared in our January 2, 2010 Newsletter. This was a Christmas present I made for my daughter Jenni and husband Matt. I actually made two of them and they turned out great. I used 1" X 4" and 2" X 2" Alaskan Cedar. 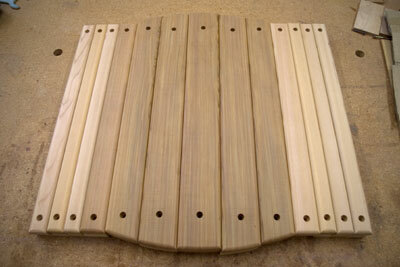 1" X 4" - (2) sides 18 1/2", (2) ends 14 1/2"
(1) 1" X 4" X 19 3/4"
(2) 1" X 2 1/4" X 19 3/4"
(2) 1" X 2" X 19 3/4"
(2) 1" X 1 1/4" X 19 3/4"
(4) 1" X 1" X 19 3/4"
(2) 1" X 1 1/8" X 19 3/4"
To make the table base, which is the four pieces made into a square, I started off by radiusing the ends of the sides. 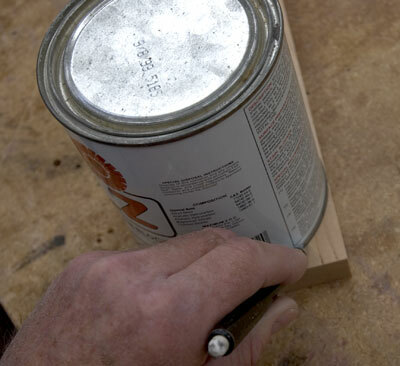 I used a paint can to mark it and cut them on the band saw. The ends are set inside the sides about 1 1/2" back from the ends. 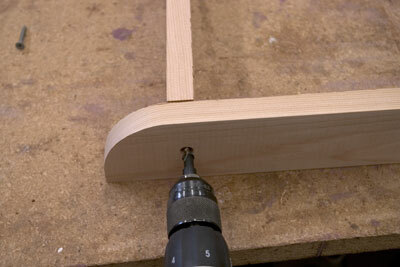 Counterbored a 1/4" hole for the plug using a Forstener bit and drill through with a small countersink bit for the screws. I drew a squared line as a guide for getting the ends straight. Using an outdoor glue and deck screws I installed the ends. Next I cut the top pieces. 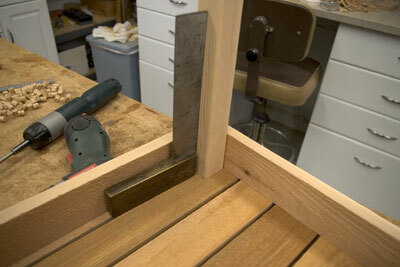 Since they will curve along the edge I cut some shorter than others just to save a little wood. I used a big French curve to lay out the pattern. It's extremely important from this point on to keep the pieces in order. I numbered the bottoms of each piece with chalk. 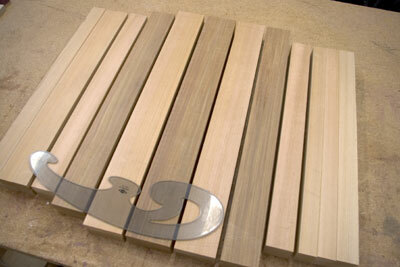 Cut the ends of each piece with a band saw. 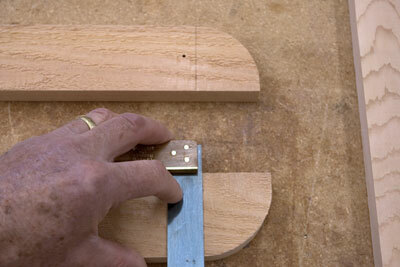 Using a roundover bit radius the top edges and ends of each piece. 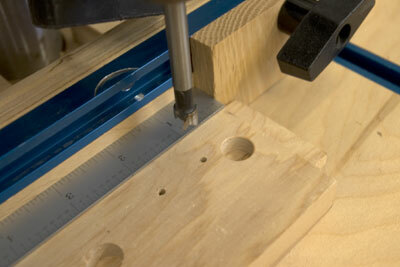 Set up the fence on the drill press so the holes will be centered on each piece and in line with the base sides. 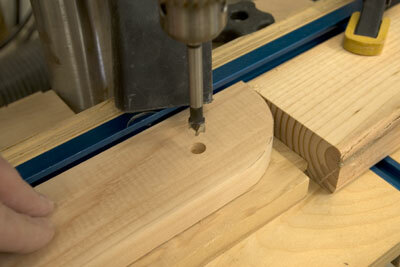 Counter bore each hole for the plugs and drill through with a small countersink bit. Sand all the top surfaces and edges smooth. 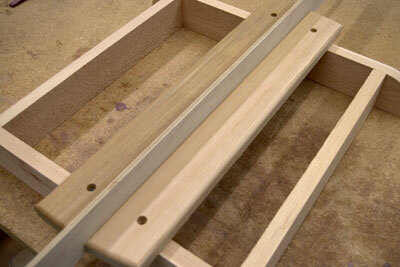 Starting with the center board mark the center of the sides and drill pilot holes. 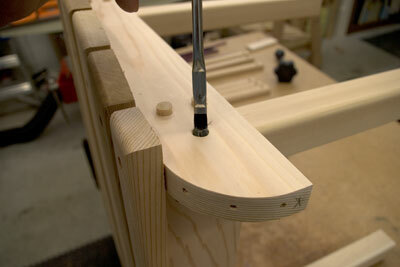 Screw the center board in place and then use a spacer to locate the next boards out. Continue this process for all but the three end pieces on each end. You will have to remove the end pieces to gain access for screwing the legs on. 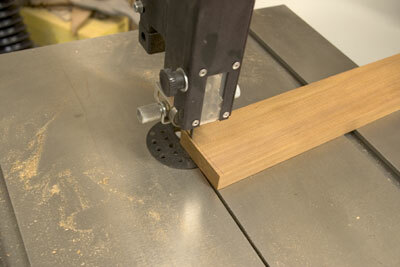 Mount the legs using a square. 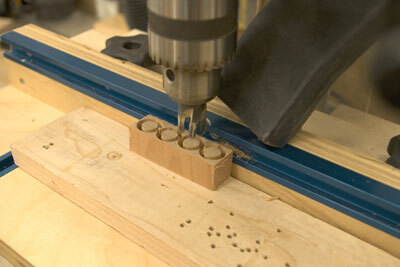 Drill the holes the same as the others with a counterbore and through countersink. At this point I took all the top pieces off and reinstalled them in place with glue and deck screws. Now the fun part of making all the plugs. I used a taper plug cutter on the end grain to give the plugs some contrast when finished. From a 1" X 4" I could get four plugs at a time. 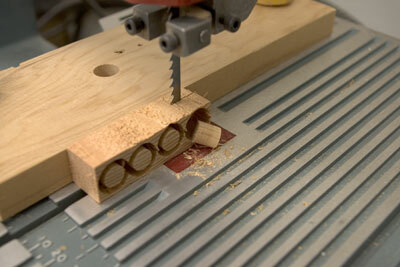 After the plugs are drilled cut them loose with a band saw. Carefully apply glue in each hole being careful not to get any on the board surface. Gently pound in each plug. 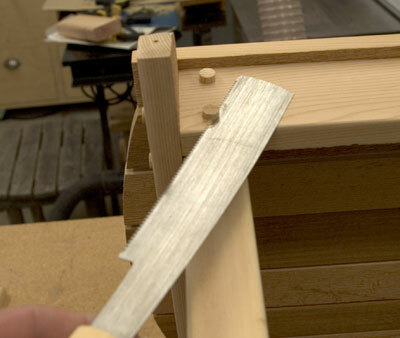 I say gently because if you are not careful you can split the cedar near the ends. 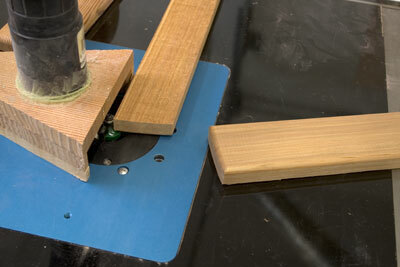 Using a flush cut saw trim each plug flush to the surface. Install the remaining end pieces and plug them. Some people like to leave cedar natural and let it silver over time but I decided to stain them with two coats of Penofin penetrating stain. If they are somewhat protected from the weather they should be good for two or three years before more stain should be applied.